At the National Sale in Shrewsbury on saturday july 20th we bought FHT: 13 044, a son of Solwaybank Skyfall out of a dam by Cairness Castello and going back to Solwaybank Stylemaster. This one heads across the North Sea and is bought in partnership with some Dutch friends, Suffolk Siero, Escobedo Suffolks from Spain as the flock of my Italian friend Fabrizio Arena. I am very happy to let you know I had the opportunity to privately buy from Judith and Iain Barbour ramlamb Ewebank JOD:11:021. His sire is Rhaeadr Rastafari and his dam JOD:K9. She is out of JOD:F17, one of the best stock ewes of teh Barbours. She is an ET sister of Ewebank Kelso Star. Sold for 5000 gns at Kelso ’08. This family is doing well over recent years in the Barbours flock. JOD:F17 is an ET sister of Ewebank Armani and also from JOD: F16 (Royal show breed and reserve interbreed champion 2007 and Supreme champion Great Yorkshire show) and also from JOD: F15. 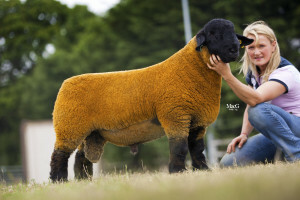 Top priced Suffolk ram at Kelso 2008 sold to Nathan Tiffan for £5000. A son of Baileys Bugatti out of JOD/ F17 sired by Glenisla Grimaldi. A Suffolk shearling ewe from David and Julie Inman clinched the interbreed sheep championship yesterday under judge Chris Holmes, Worcester. The ewe is a daughter of a ewe gifted by the Inman’s to their grandson Tom on his birth three years ago and is by a Santon sire and out of a ewe by Solwaybank Ranger. She previously stood breed champion at last week’s Leicester Show. Standing reserve to the Suffolk was the Charollais champion a ewe lamb from Percy Tait. This one is homebred and by Dogtanion a tup bought from Debbie Marwood. Jennifer Atkinson and David Smith’s team of three Hampshire Downs took the interbreed group award, with Mr Tait again taking second spot with the Charollais.